This ¾ length standing, professional or ‘occupational’ portrait shows Dr Edward Swarbreck Hall, aged 54, who was house surgeon of the Hobart Town Hospital. He is posed next to a piece of scientific apparatus with two large anatomical illustrations (one human and one zoological) behind him with diagrams relating to herpetology (snakes) and lepidopterology (moths/butterflies). Dr Hall is dressed in a two-piece ‘business’ suit of dark wool, comprising the more formal style of double-breasted tail coat with notched lapels and turn back collar, and matching trousers, worn with a double-breasted waistcoat in a darker fabric (possibly silk) buttoned over a white linen shirt with a high collar and a black silk neckcloth. He is clean shaven and wears his greying hair with a side parting, brushed back from his forehead and curling over his ears. This image is a rare example of a ‘chromatype’ photoprint – a direct positive print onto paper from a glass collodion negative using chromium salts as the sensitive ingredient – of which only a few dozen specimens survive. It is signed and dated by Tasmanian photographer Frederick Frith who invented the process in 1856. An early demonstration of the potential of paper photography (though perhaps looking more like a painting than a photograph) the size and vitality of this new photographic format, in comparison with the miniature scale of daguerreotypes and ambrotypes, would have been quite stunning at the time. 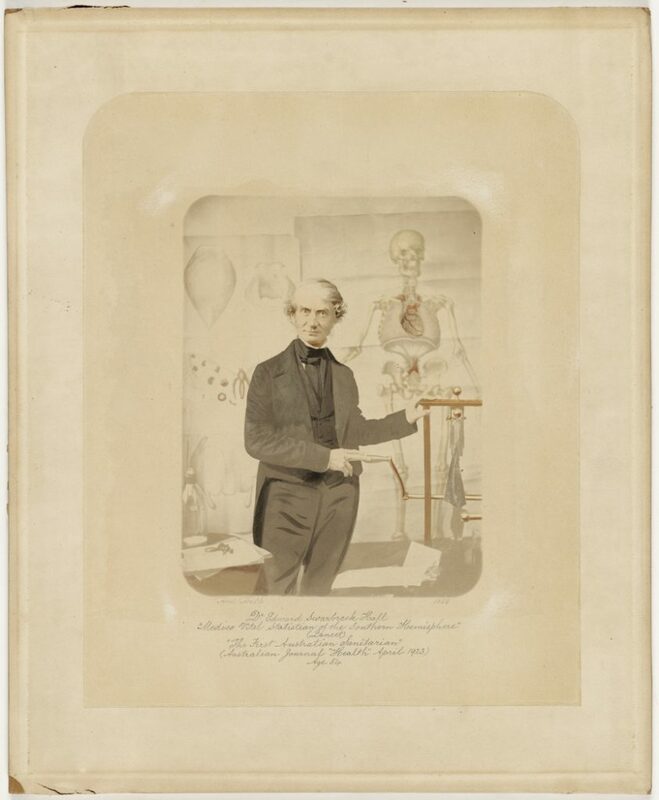 Pioneering medical scientist and moral activist, Dr Edward Swarbreck Hall (1805-1881) studied medicine in Dublin and London, becoming a member of the Royal College of Surgeons and a licentiate of the Society of Apothecaries. Coming into contact with the poverty, filth and unhealthiness of slum life in the backs streets large industrial cities like Liverpool, where he also saw the devastating effects of outbreaks of disease like smallpox and typhoid fever, Hall became aware of the peculiar problems of large numbers of orphan and destitute children herded together in charitable institutions and realised the importance of diet and nutrition in relation to health. Arriving at Hobart Town with his wife in November 1832, Hall took up duty as a medical officer, advertising his services in the Courier on 27 September 1833. Appointed as house surgeon to the Hobart Hospital early in 1853, it was during this time that Hall began to make a comprehensive statistical study of Hobart with a view to sanitary reform. In July 1856, Hall’s scientific approach to problems of public health based on objective statistical enquiry were documented in his article, ‘On the Medical Topography and Vital Statistics of the City of Hobarton, Tasmania, and its Southern Sub-Districts for 1855’, published in the Australian Medical Journal in a series of parts between 1856 and 1858. It was through Hall’s efforts that questions of sanitation and public health in Hobart Town soon became matters of world-wide scientific discussion and investigation – recording 883 deaths out of a population of 26,095 and equalling a mortality rate 34/1000 which exceeded the 25/1000 deemed acceptable in European cities like London – proving that Hobart was statistically pre-eminent for its excessive mortality. In 1861 Hall became chairman of the executive committee of the new Benevolent Society. His untiring advocacy of public health reforms was chiefly aimed at assisting helpless children, and he was largely responsible for the compulsory Vaccination Act that, at his death, was being rushed through parliament. The honour of being the first man in Australia to preach the gospel of public health with an inspired intelligence and courageously to fight for health reforms in the face of great obstruction belongs to Dr Edward Swarbreck Hall, M.R.C.S., of Hobart. In colonial photography, the term ‘chromatype’ referred to the process of creating direct positive prints onto paper from glass collodion negatives made by using chromium salts as the sensitive ingredient. It produced a type of thin, matt olive-toned albumen or salted paper print which was usually subtly overpainted in oil or watercolour. Even when the colouring medium is delicately applied, in some cases the overpainting completely obliterates the photographic base and it can be hard to distinguish an image as a chromatype. Frederick Frith (1819-1871) was a successful portrait painter and professional photographer in colonial Melbourne and Hobart. Born in the UK, he was from an English family of miniature painters and silhouettists and worked as a painter in Melbourne in 1853 where he claimed to have practiced in London, Brighton, Scotland and Ireland. Initially establishing himself as a portrait and animal painter, in 1854 Frith moved to Hobart Town where he collaborated briefly with the Duryea brothers and Archibald MacDonald, and then with John Matthieson Sharp from 1855 to 1856; Sharp had just bought a short-lived Calotype Gallery established by English photographer Walter Dickenson. Together, Frith and Sharp made coloured portraits and landscape views, Sharp taking the photographs and Frith colouring them and advertising their Chromatype Gallery at 110 Collins Street in the Hobart Town Advertiser on 20 July 1855. Establishing his own studio in 1856, Frith’s brother Henry had joined his enterprise by 1857. Marrying Emma Golding in Holy Trinity Church, Hobart Town on 11 October 1858, Frith continued the Hobart Town studio as well as advertising his abilities as a painter, but the firm’s painted photographs seem to have been far more popular with the public. This was hardly surprising given Frith’s painting prices, although his coloured photographs were also expensive. In December 1858, The Cornwall Chronicle was reporting that ‘portraits of the elite of the Tasmanian community…any subject whatever can be taken so quick [‘a sitting of 5 seconds’] in the new process of Messrs Frith & Co. (25 December 1858, p. 6). In 1859, operating as Frith Brothers with an additional studio in Launceston, the pair produced the first commercial albums of views of the state, entitled Tasmania illustrated, and by 1861 Frith was claiming he could produce his images on plates (china), ivory, paper or leather. In 1862 Frith moved back to Victoria, while his brother Henry remained in Launceston, where he was involved in a public stoush with Alfred Bock over the correct use of the ‘sennotype’ process. Frith continued to operate until in 1867, when he sold his negatives to George Cherry and moved to New Zealand. Given to J.H.L. Cumpston in old age by E.S. Hall’s son on seeing Cumpston’s article about Hall published in Health, v.1, no.4, April 1923.